Last day of August? Seriously?!? Where did this month go? I swear it's either still May or we have gone through a time warp... This weekend was spent filling our house with sawdust while we board and batton our dining room. I won't share any pics yet because there's still the painting to be done, but I feel like the last 3 days were overly successful. We rested, we worked, we socialized- even the weather was altogether pleasant. Now that the sawdust has quite literally settled, I feel satisfied with our progress on all fronts. 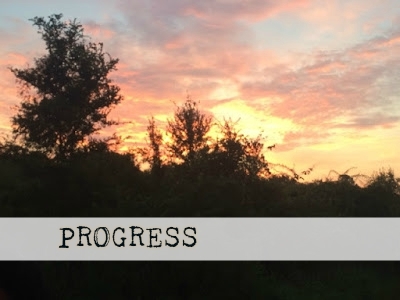 Progress on all fronts is a fair way to describe things right now. Every day we are getting a bit more settled, a bit more organized, (Cal) a bit more house trained, and, with running, it feels like I have a bit more confidence. And that wasn't the only racing activity this weekend! After taking a good hard look at that Summer Bucket List a group of us did one of the free 5ks. Run for Wellness organizes 2 free, timed 5ks a month in Houston. This was my first one, but it was great! My race went well. I can tell that some of the strength and speed training I've been sweating through have actually started to help. I didn't break any PRs, but felt solid through the course. My pace was 8:22, but there was definitely some left in the tank at the end of the course. However I don't feel even a little bit bad for not laying it all out there because I hadn't raced since May! I was pretty cautious and wanted to maintain an 8:45 pace and beat my goal. This race was a confidence builder for me. Who am I kidding- all of today was great! Following the race there were donuts, home reno, and some family time- today was phenomenal! I have a feeling this week is going to be a pretty great one! We are headed to one of my favorite places on Earth this weekend and there is a very special little niece that I get to see in just a few short days! Hope you have just as wonderful things coming up this week! So happy to hear you were able to run a race this weekend!! Cross that one off the list :) hope you have an easy and great Monday!! Yay for signing up for the half!!!! You were so fast at your 5k, teach me your ways! Once upon a time i was fast, but now I'm thrilled when I run 10 min miles. Congrats on signing up for your half! Even if you've been training for a race it always makes it more real to be officially registered. Sounds like you nailed your 5k this weekend too. Nice job! You're doing your own board and batten? I bow down to you! Can't wait to see the result!